& Stella Parson Elementary School: a Title 1 school in Las Vegas, Nevada. He also serves as the technology chair where he helps provide training to teachers in order to help them utilize technology in the classroom. "Next year, I will be teaching 5th grade," Korder says. "So I can further help our school grow in regards to the STEM program and utilizing technology as a school." When Korder won an Arduino kit from Intel Education this spring, he was ecstatic at the possibilities. "As an educator, my job is to supply my students with rich academic experiences and help them to utilize technology," he says. 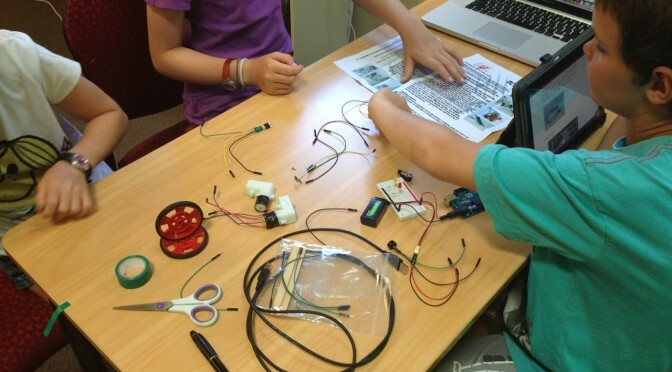 "The Arduino program is helping my students to grow and expand their knowledge base." school's curriculum, the concept, for Korder, is relatively new. "I am growing with my students," he says. "I truly believe STEM subjects are necessary in order for today's young men and women to be successful. My students need to be competitive in future job markets and STEM is a pathway to that success. My plan is to expand STEM subjects next year." Korder and his class received the Arduino kit just before school let out last June. He had assembled a research team of 3rd grade students to develop a plan of how they would use the kit in school. Prior to receiving the kit, the class experimented with code and scoured the Internet for resources and ideas in order to better utilize the Arduino components. With the time they had left, Korder's students had learned about circuits, electric currents, and circuit boards, and were able to build a simple circuit themselves: getting an LED light to illuminate. Over the summer, Korder attended the ISTE - The International Society for Technology in Education - conference in Denver, Colorado. He saw some amazing things that educators were doing with the Arduino, such as robotics. Inspired, Korder began planning curriculum for his upcoming 5th grade class, vowing to dive more into STEAM subjects and to dub Fridays as "Computer Science Fridays," where students will use the Arduino kit to build a number of engaging projects, ranging from color mixing lamps, a simple Arduino- based calculator, and a smart night light, to more complex circuit projects such as Arduino-based robots. learners design and create while giving them the opportunity to understand the language of coding. It is open sourced which really allows for creativity to take place. The possibilities are endless and the kit allows for true discovery to occur." Introduce students the world of prototyping circuits using resistors, potentiometers, photoresistors, flex sensors, servos and piezoelectric buzzers while exploring the programming concepts necessary to make motors spin, LED's blink, and music play, all programming an Arduino board using simple C++ code.